The Compendium combines the perspectives of the OSCE Office for Democratic Institutions and Human Rights (ODIHR)’s work on identity management and freedom of movement, and the OSCE Transnational Threats Department’s work on travel document security. It is the result of consultations initiated in 2013, and the subsequent process has included a series of expert meetings and a detailed questionnaire distributed to all OSCE participating States in August 2016. The Compendium is intended for the use of identity management practitioners and policymakers who are exploring options to improve their national identity management infrastructure as a whole or some of its individual components. 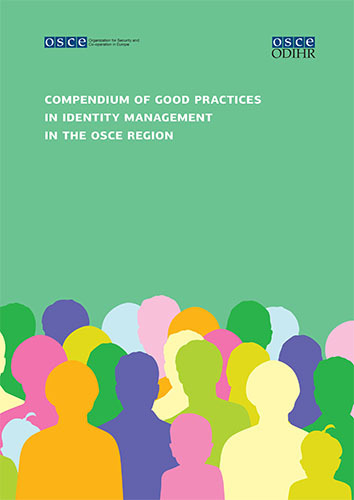 The benefit of the Compendium comes from the wealth of information it provides in a structured and analytical format about the characteristics of identity management systems in OSCE participating States. Putting a particular focus on the prevention of identity fraud: identity fraud is the main threat to the integrity of the entire identity management framework. The more a system is exposed to fraud, the less overall trust the public will have in the process, including its international dimension: in the context of increasing global mobility, a well-functioning national identity management system is no longer sufficient for preventing identity fraud; instead, a global or at the very least a regional approach is necessary.